A few weeks ago, I was working in our shop and – through foolishness on my part – managed to slice open a finger. After an expensive trip to an urgent care center, I was the owner of several stitches. Needless to say, safe workshop practices came to the forefront of my mind. So, to kick off this year, I would like to provide some safety guidelines for working on your car. Please bear with me, and read this information. A refresher course in safety never hurt anyone, and it could save you or a member of your family from getting hurt. Also, as parents we need to teach our children to work safely by modeling good safety practices and making sure they take safety precautions seriously. I am sure everyone reading this has had some foreign material get into an eye, and many of you have had a scratch on the surface of your eye. As you found out your eyes are very sensitive, and easily damaged. While working on your car all manner of material will fly around so ALWAYS WEAR EYE PROTECTION. Two types of eye protection are available for a reasonable price at hardware and homes stores: safety glasses and safety goggles. Safety glasses have clear protective lenses with side shields. They are used when you don’t wear glasses or when you wear contact lenses. They have adjustable temple pieces to fit your head, but can also be purchased on-line in children and adult sizes. Safety goggles have a clear protective lens and fit over regular glasses. Safety goggles do a better job of keeping floating dust out your eyes than do safety glasses. So, even if you don’t wear glasses, you may want to consider safety goggles. Consider wearing safety glasses when drilling, sawing, chiseling, etc., but wear safety goggles when sanding, painting, and using graphite. I know that eye protection is a hassle to wear, but don’t risk your eyesight over a little comfort. An emergency room visit to remove a wood fragment from your eye is an experience you want to avoid. You will create a considerable amount of wood dust while working on your car. Don’t breathe that dust into your lungs. Instead, WEAR A DUST MASK whenever you are sanding, filing, drilling, or lubricating with graphite. Also, when spray painting, work in a well-ventilated area, and wear breathing protection. Most home supply store sells two types of particle masks. The first type, a Comfort Mask, is less expensive. It is made of a relatively thin material, has one thin rubber band to secure the mask, and does not have a seal on the edge of the mask. The other type of mask is intended for drywall installers and painters, and is sometimes referred to as a Particulate Mask. This mask is thicker, has two sturdy rubber bands, has a seal around the edge, and is slightly more expensive. Admittedly the Comfort Mask is more comfortable, but it does a poor job of filtering sawdust. I strongly recommend using a Particulate Mask. When spray painting, consider using more serious breathing protection. Hardware and home store offer breathing masks with replaceable filters. These remove more particulates, and some of the harmful paint fumes. During my junior and senior years in high school, I worked at a custom woodworking mill during the summer. I personally had several close calls with power tools, and witnessed a few injuries. In one close call, a table saw (with the safety guard removed) kicked-back a large sliver of wood which embedded itself in a board across the room. Fortunately no one was in the way. In another case, a different saw kicked-back a sliver that went through two fingers of the operator’s hand. Fortunately the wood missed the tendons, and he regained full use of his hand. The point of this is to encourage you to BE VERY CAREFUL WITH POWER TOOLS. Make sure you know the proper way to use the tool and don’t remove the safety devices. There is also one non-power tool to be very careful with – the wood chisel. Wood chisels need to be very sharp to work properly, and considerable force must be applied to the chisel to gouge out the wood. Both of these characteristics (sharpness and force) can lead to gouges in your hands. When using a chisel, ALWAYS POINT THE SHARP END AWAY FROM YOUR BODY. At a pinewood derby workshop two years ago, a parent was using a wood chisel and failed to follow this warning. He proceeded to slice open the palm of his hand, requiring a visit to the emergency room, and a significant blood clean-up operation in the shop. Even after more years than I care to remember, I will never forget a photo that hung by the drill press in the machine shop at our high school. The photo showed a mass of hair mixed in with metal shavings, lying on the table of the drill press. Someone with long hair had used the drill, the loose hair got caught in the drill bit, and … well, you can imagine the rest. The clear lesson is to SECURE LONG HAIR when working in the shop, especially when using any revolving tool (drill, power saw, etc.). Also don’t wear necklaces, bracelets, scarves, and other loose articles (including clothing) while working on your car. Any loose article can get caught in a revolving tool, leading to serious repercussions. Wash your hands after handling lead (and don’t put your fingers in your mouth). Keep lead away from food, water, and food preparation areas. Collect and properly dispose of any lead pieces. Don’t sand or saw lead (creates particles). To cut lead, use cutting pliers or use a hammer to drive a flat blade screwdriver through the lead. Don’t melt lead. Not only are the fumes toxic, but the lead could pop or splatter and cause a severe burn. Also, if melted lead is placed directly into a cavity in the car, it will cause the wood to smolder and can ruin a nice paint job. Oftentimes, accidents occur when people are in a hurry. In the rush to complete the task, good judgment is put aside, which greatly increases the chance for an injury. So, don’t wait until a few days before the race to build your car. Instead, plan ahead and get started as soon as possible. By working slowly over time, you will work more safely, and the end result will likely be a better car. I wish all of you a wonderful and safe derby experience. P.S. Okay, I’ll tell you how I cut my finger. I was using a drill press to drill a somewhat large hole in a strip of sheet metal. When doing this kind of drilling, the sheet metal must be securely clamped to the drill press table (or the work surface if using a hand drill). I knew this, but thought to myself, “I can hold it.” Stupid me. Of course, the drill bit “bit” into the metal, easily snatching it from my grasp, and proceeded to wield the sheet metal like a revolving knife blade. You can imagine the rest. I was fortunate to only get one finger cut. My son Will is in his third year of Cub Scouts and really loves working on his pinewood derby cars. Shown is “The Natural”, his car from the 2007 season. After I cut the block down to the thin wedge that he wanted, he sanded off the saw marks and found that the straight grain lines were quite striking. So, instead of paint, he opted to just clear coat the car. 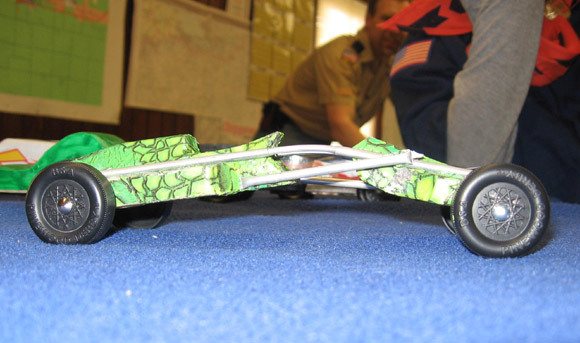 The car took third place in the pack pinewood derby and thus qualified for the district races (his third trip). The night before districts I added more graphite and he worked it in and we must have gotten it right. At districts (where there were 118 entrants) he beat his pack mates in the first round and then got faster and faster, eventually moving to seventh place overall and fastest Bear Cub Scout. I am the Cubmaster for our pack and, due to some very successful recruiting last year, we had about 20 boys who built their first pinewood derby car this year. To make sure everyone had a chance, we provided a hands-on seminar where experienced leaders provided tools and showed the boys tips and techniques to build faster cars. Since I noticed that all the boys designed cars that looked like typical racing cars, I was determined to build something different for our open class to show them that pinewood racers can be anything. 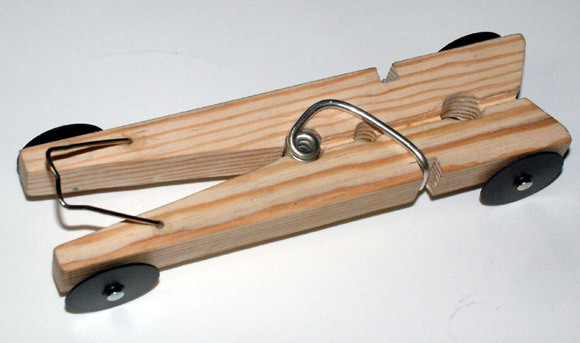 This clothes pin car is what I came up with. Our open class has fewer restrictions and is mainly for Dads so they will let their Scout build his own car. The wire bail on the front rests on the starting pin and is set high to allow it to take off sooner than other cars. This technique combined with your outlaw wheels made this a very fast car — second place was three car lengths back. It had the added benefit of not needing to be painted. It got a lot of comments from the boys and will hopefully spark their imaginations for next year. 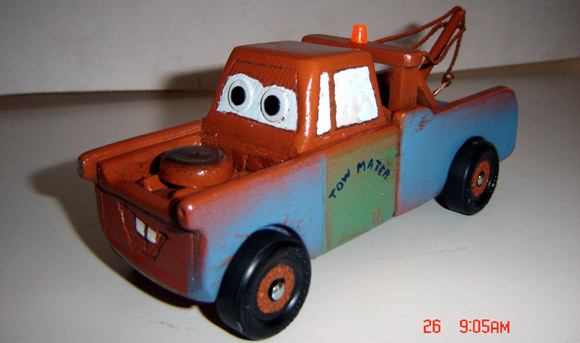 This year my son and I built this “Mater Truck” using supplies from your site and received a trophy for most original. Thanks once again for all your tips and advice. 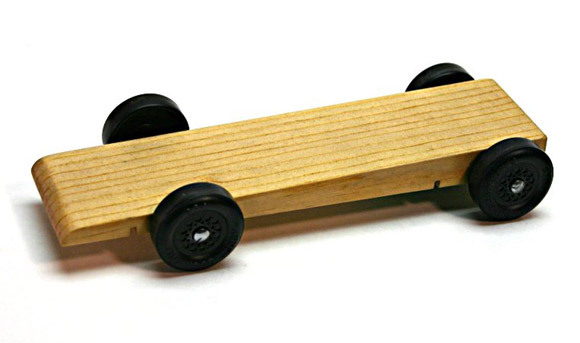 This year, Ryan and I built a pinewood derby car that, by design, had two pieces: a front section and a rear section that were connected by telescoping aluminum tubing. This telescoping aluminum tubing allowed us to adjust the wheel alignment precisely. Then, to hold it in place, two temporary turnbuckles were attached to each side, allowing us to roll it down a long smooth surface, observe the direction it turned and then correct it quickly and easily by adjusting the turnbuckles. Once it was going as straight as we liked, I had Ryan put super glue on the aluminum tubes to hold it in place and add a second straight piece of aluminum tubing about a quarter of an inch below the telescoping aluminum tubing. We then remove the turnbuckles and it worked great. Before doing this procedure with Ryan, I had tried it on my own with my car (for the parent’s race). I used brass tubing, one on each side and one in the middle of the top side of the car. To make the front end lighter on Ryan’s car, we used aluminum tubing instead of the heavier brass. With Ryan’s car, something happened that required us to perform the operation again. This meant cutting new tubing for the telescoping part (maybe I could have unbound the glue, but didn’t think of it at the time). We had to adjust it again after the car came off the track because the front end was too light. So we wound up putting a small piece of lead in the front to keep it on the track. A third redo of alignment was required when we decided to replace one damaged wheel with a new wheel. When we arrived at the race, we had time to weigh-in and have one test run. The pack allows you to race before hand for fifty cents per run. The proceeds go towards buying a track. So, we placed the car on the starting line and counted down 3-2-1 GO! Ryan did not pull the lever down fast enough and the car hopped over the starting peg, bounced once on the track and fell to the floor, breaking one wheel off Ryan’s car. The wheel ripped the axle out of the wood as the entire weight of the vehicle came down on that side. Now remember all that work we did to make it go straight? Forget that, it was all immaterial now; we had to just glue it back in place and eye-ball it. There was no time to do our elaborate alignment process. He won the first race anyway. He won the second race and several more before the next structural problem occurred. The end of the track had a four inch piece of foam rubber as a stopper with two large screws in the middle to hold it there. That gave us about two inches of foam before it hit metal. That abrupt stop is okay for solid body cars, but for this thing that looked like a rail, it was disaster. The aluminum tubing started to bend more and more after each race, making the center bow up like the hunch back of Notre Dame (see photo below). At one point it was so bad, that the front end scraped the center guide and it stopped half way down the track. Up until then, we had taken first place on every heat. To fix the problem, I slowly bent it back down, fearing that the aluminum tubes would crack or just snap. I did not go so far as to try and straighten it completely, I just wanted it to clear the center guide. Then we applied glue to the lower support tubing as it had come loose. We had already re-glued that piece several times with fast drying super glue. It didn’t dry all the way prior to the next heat, so it kept breaking off and we were in the pits after almost every race. Someone suggested running it backwards and that resulted in a second place finish. Now we had one second and one third place. I came up with the idea of putting my jacket sleeve down after the finish line, in Ryan’s lane, as a stopper and that helped greatly. By slowing the car down more gradually, we did not have to do any re-gluing and we could run faster not going backwards. Don’t let anyone tell you rear-weighting the car is not important! We were running out of glue so I went out to the car to get more glue and when I returned I found Ryan with a sad face holding two pieces of his car. He had to run it once without my jacket as the stopper while I was gone and it just busted it up. My first though was, “We are done. That’s it. I have tried and tried to keep this car going, but its over.” After thinking about it a while, I started re-gluing it again. We found a rubber band to hold one piece while we glued another and by the next heat, we were standing there with wet glue all over our hands. They held up the entire race waiting for us, but finally we were back in the race again. He won the next race. He won every race after that. Kids were cheering for Ryan’s car. It looked ugly now, but earlier, the boys judged it as Most Unique Car. People were joking, “He should get a prize for the most enduring.” I mused, “Is this a demolition derby or a pinewood derby?” We kept tabs by asking the kid behind the computer, “How many more heats?” Could this junker hold out? Six more to go, five more to go and then when it was only three to go we had to start applying glue again, but were able to nurse the sick beast through to the end. After all the heats were complete, the tallies were in … they announced a tie. The Scout leader (Bill) did not say if it was a tie for first, second or third. He said Ryan Wolff and some other kid would have to have a tie breaker. Earlier, Ryan asked me if we could let it hit the end of the track on the last race so he could watch it break up again, just for the fun of it. I said, “What if there is a tie?” Glad I thought about that! So it was a close race, but Ryan beat his opponent by a few inches and the crowd cheered. The jalopy won! Bill asked us all to take a seat as he prepared to announce the winners. Third place was not Ryan and Bill didn’t call his name for second place either. He won first place, against all odds, broken and bent-up, the jalopy won first place. Our YMCA Indian Guides/Princesses just had their yearly pinewood race. There were two 3-lane tracks set up. My son ran on one, my daughter on the other. Of the 12 cars which ran on my daughters track, four of the cars, including my daughters, jumped off the track all on the same lane and the same spot. The cars which jumped seemed to be the faster cars; they all won their heats in the other two lanes. When I complained, I was told, “That’s the way it goes,” and nothing could be done. Upon inspection the track joint was not flush creating a step, but only in one lane. Since the times were averaged for three heats, all cars which jumped off the track placed last. For the future, what policy/rule would you suggest for this type of occurrence. Sorry to here about the problem, and how it affected your daughter’s car. First, before the race, the track needs to be inspected by feeling the joints, and then running several fast cars down each lane. This will identify issues that can be corrected before the race. If a car leaves its lane, and the race officials determine that a fault in the track or starting mechanism caused the incident, the heat will be rerun after the fault is repaired. If the car does not interfere with any opponent, the car will automatically lose the heat, and the remainder of the cars in the heat will be judged normally. If the car interferes with any opponent, the car will automatically lose the heat, and the heat will be rerun with the remaining cars. The problem I’m having is that the car blast out of the gate, instantly taking the lead by 6-18 inches after 8 feet of track. But when it gets to the flats, it starts wobbling from side to side, slowing the car down enough to lose the lead. What do I do? The problem you are describing sounds like a weight distribution issue. When you balance the car on the edge of a ruler, how far in front of the rear axle does the car balance? If the car balances less than 1 inch in front of the rear axle, then the car is likely too aggressively weighted for your track. When the car hits the flat section, the front wheels are ‘unloading’ (not enough weight to hold the front end firmly to the track), which causes the car to no longer steer straight. This problem can be corrected by moving some weight forward on the car or by implementing rail-rider alignment. My boys had their district races this past Saturday. We did not do all that well, but that’s okay; we all had fun. I got copies of the times for both races and I compared these to the race times from our pack race. Both cars were substantially slower at the districts, but I know for a fact that the district race was run on the same track as our pack race. We did not play with the cars after the pack race a few weeks ago. We put them in a cigar box and the cars sat. I also did not re-lubricate the wheels with graphite which may have not helped. Any ideas? Well, either the car got slower or the track was set up differently (i.e., slower). The graphite was used up at the pack race, so there wasn’t enough for the district race. Track was set up on a slightly uphill surface. Track was set on a surface slanted slightly to the left or right. Track joints were not aligned properly. It sounds like you protected the car, so wheel alignment is probably not the issue. If the times were incrementally getting slower, then I would bet on the lubricant. If the times were consistent, just slower, then I would bet on the track setup.